If this makes me a shoemaker, where are the elves? I've been doing baby booties for awhile, and love their tiny adorableness, but recently, someone asked, "Could you do adult-sized house slippers?" Never ask me if I can do something... Now it's a challenge, not just a question! 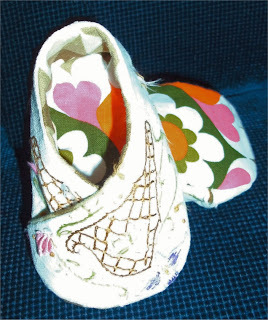 I started out with a baby shoe pattern I already had (thank you, www.littleshoepattern.etsy.com), and then I looked at several pairs of slippers and simple shoes I owned and thought about how they were constructed. 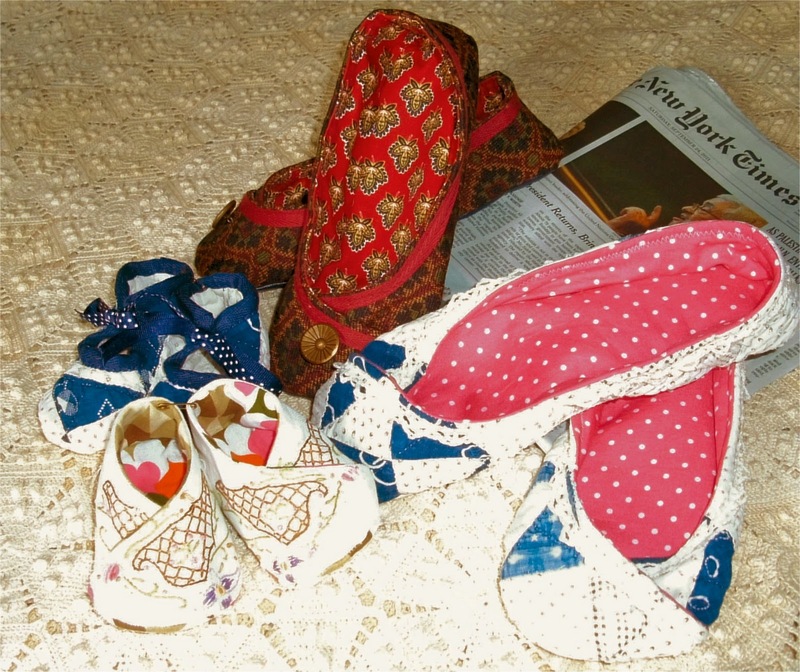 I had some scraps of tapestry-style upholstery fabric (got it FREE from my local "Freecyle" on-line group. If you don't Freecyle, you're missing out on a Wonderful Thing. ), and I bought some remnants of soft vinyl at the fabric store for the soles. 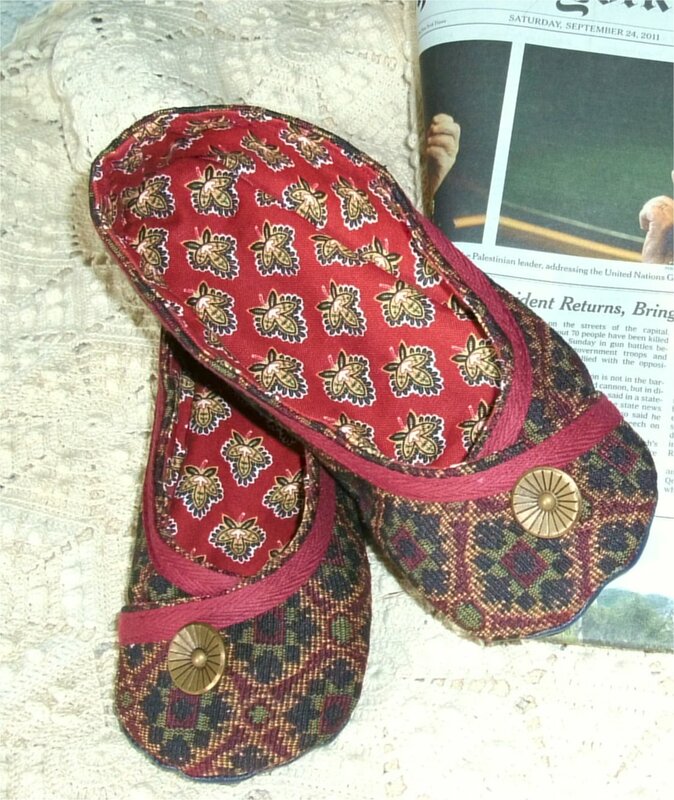 Tapestry slippers with vintage buttons as trim. An old cutter quilt with some cotton tatting lace trim. 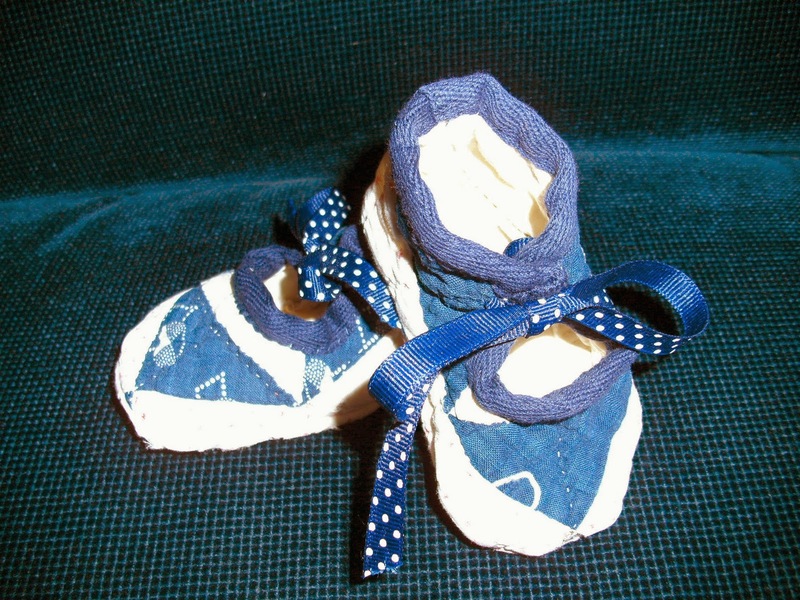 So now that I'm a shoemaker, I want to know: Where are the elves who come in the night and finish all my work? Can I make some slippers for you? 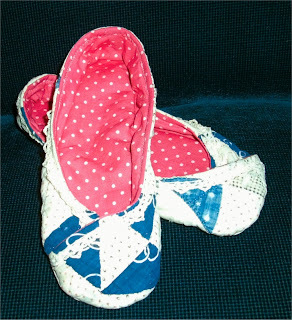 Our "fore-mothers" sewed regularly. 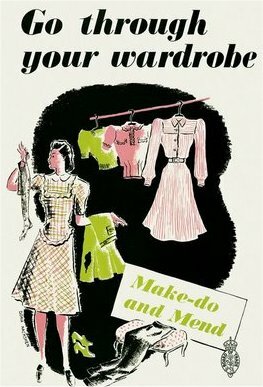 Ready-made clothing was more expensive (relative to family income), and making clothing was part of what most women saw as their "job." 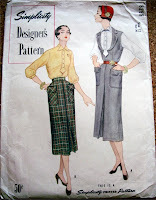 Many of us are discovering sewing again, and our love for vintage styles may lead us to making clothing using vintage patterns. 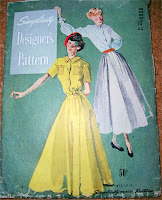 On my latest dig through antique stores (this time in Somerset, Pennsylvania), I found some wonderful vintage patterns... hence, some thoughts about retro and vintage clothing patterns. 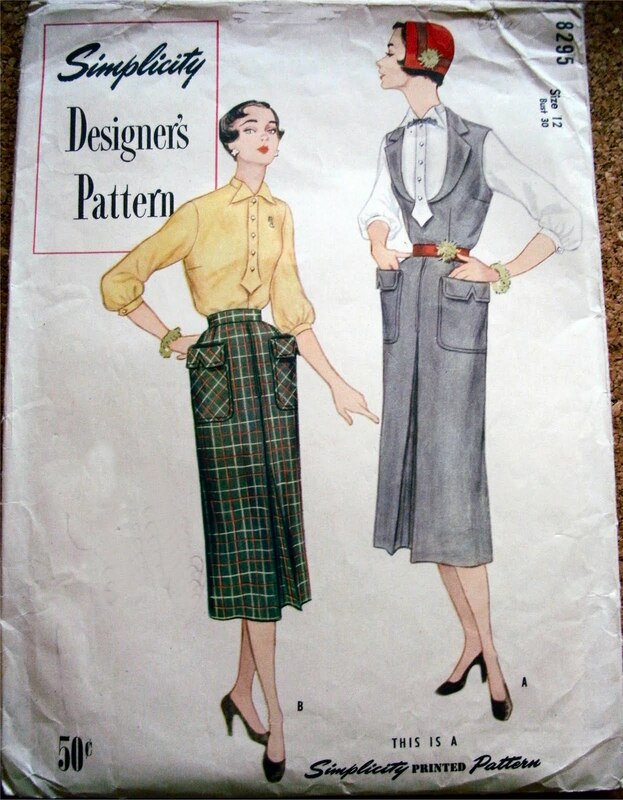 First, many pattern companies (major companies like Vogue, Butterick, McCalls and Simplicity, as well as independent ones) are issuing new "Retro" patterns based on fabulous clothing from the 1940s, 50s, and 60s. I've used several of these myself. However, you can also find vintage patterns in antique shops, at flea markets and yard sales, and on a number of websites like Etsy, Ebay and specialty sites. And how about these adorable kids' patterns? 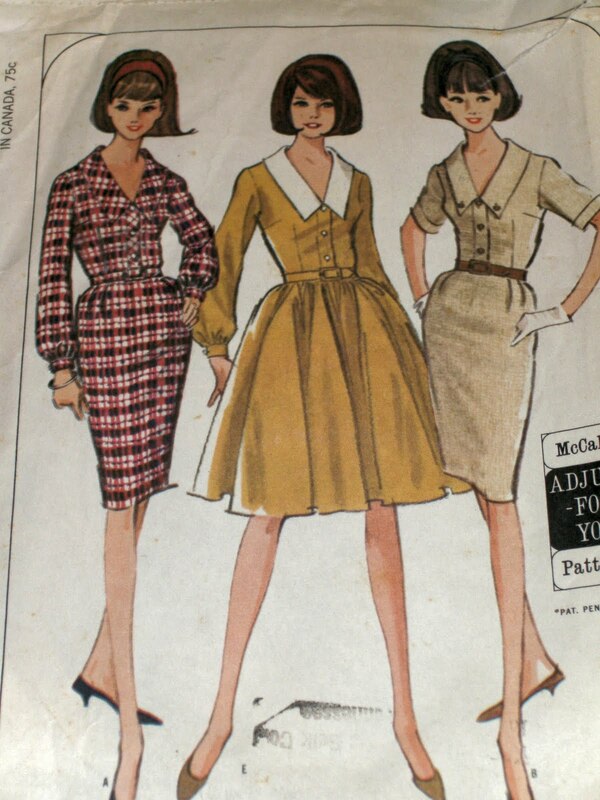 When looking for vintage patterns, it's important to know if the paper pattern has been cut by the original owner and whether all the pieces are still there. Standing in an antique shop, it's difficult to open the pattern out, spread out all the paper and count the pieces, but you can get a rough idea of the general condition of the paper pattern and instructions with a quick peek. 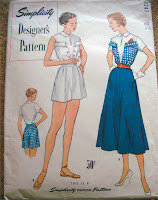 One of my "finds" is missing a piece from the bodice; I'm guessing I can draft a replacement using other patterns and the remaining pieces, but that's a decision you'll have to make for yourself. 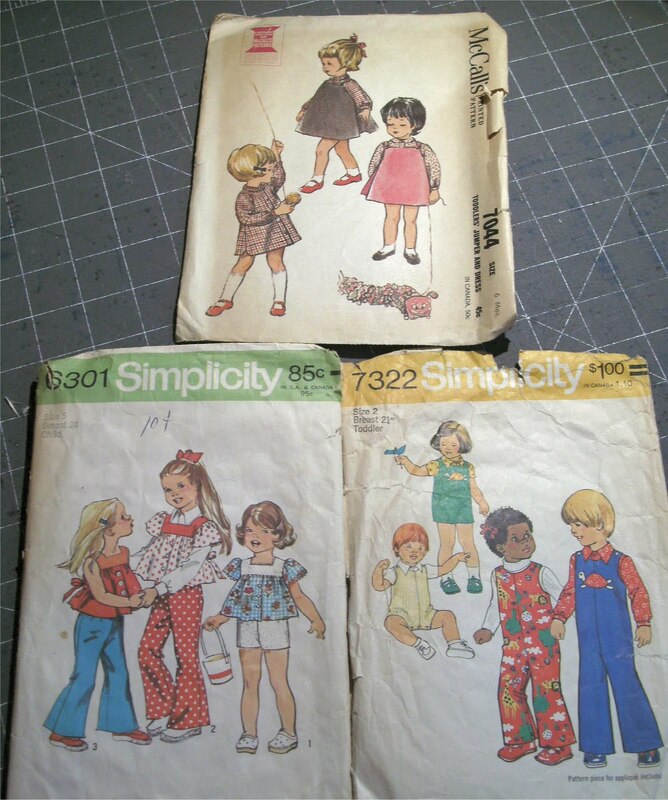 When I'm ready to use any of these patterns, I will copy the pieces to grid fabric (find it at your fabric store), so I'm not using the original pieces themselves... after all, some of them are older than I am! I'll also make a photocopy of the instructions, as the paper can be brittle. 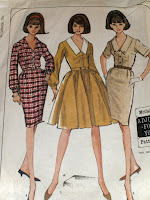 Note also that the instructions on vintage patterns usually have less detail than current patterns. 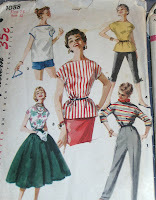 Our foremothers were more accomplished sewists than the average person today and didn't need quite as much instruction. Finally, a word about measurements. Clothing manufacturers have caved to our vanity, and have slowly changed the sizing of women's clothing over the last 50 years or so. Women also wore more "foundation garments"; no nice girl went out without a girdle in those days! What is considered a fashionable shape has changed too. Today, we're not used to wearing our clothing at the waist, but rather a little further down. Therefore, you must NEVER rely on what you consider to be your dress size when using sewing patterns. So, if we look across these three charts, we see that in 1949, a 34-inch bust makes you a size 16. In the modern, retro pattern, a 34-inch bust makes you size 12. But in ready-to-wear, the 34-inch bust makes you a size 4! 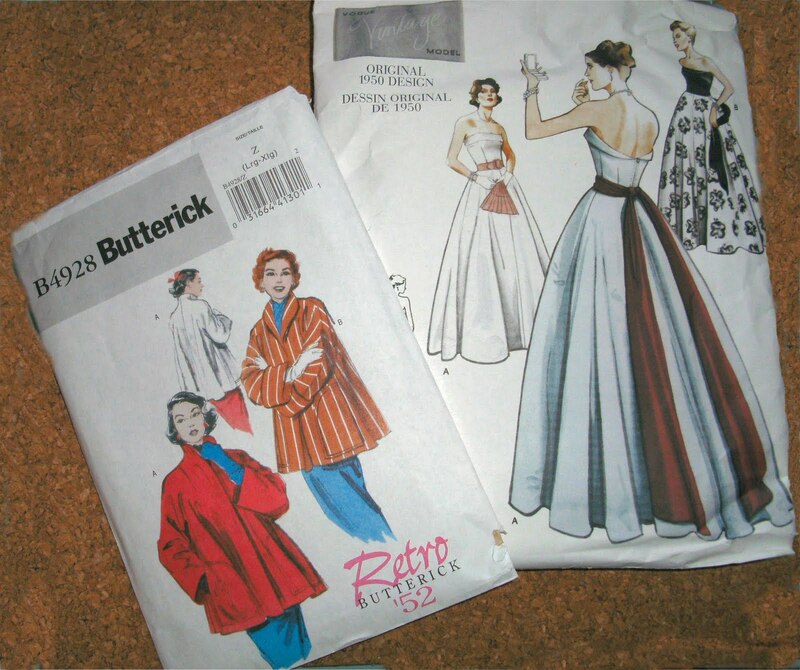 The motto of this story is: Know your measurements, and use them to adapt or purchase patterns or vintage clothing accordingly. I always cringe when I have to pick a modern pattern... the size seems outrageous. But what matters is the fit. My vanity is not served by what size I pick, but how great I look in a well-fitting outfit! I'd love to make YOU look great in something special!